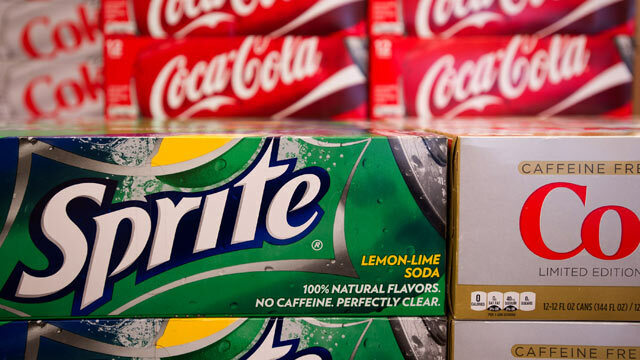 New York City Mayor Michael Bloomberg has proposed a ban on large sugary drinks in an effort to curb obesity. The plan would make it illegal for food service establishments such as restaurants, street vendors, sports venues and movie theaters to serve sugary drinks larger than 16 ounces. "In New York City, smoking deaths are down to 7,000 a year from something in the 20s. Obesity deaths are at 5,000 and skyrocketing," Bloomberg said in an interview with ABC's "World News" anchor Diane Sawyer. "Obesity will kill more people than smoking in the next couple of years." The New York City Beverage Association says banning soda will not much change the city's obesity rate. "The New York City Health Department's unhealthy obsession with attacking soft drinks is again pushing them over the top," said Stefan Friedman, a spokesman for the association. "The city is not going to address the obesity issue by attacking soda because soda is not driving the obesity rates. In fact, as obesity continues to rise, CDC data shows that calories from sugar-sweetened beverages are a small and declining part of the American diet." ABC News' Dr. Richard Besser said legislation cannot take the place of personal responsibility in choosing how to control calories. "You have to want to do it, and I don't think this ban is going to make people want to change their behavior." said Besser on "Good Morning America." Bloomberg argues that the proposal is not a government proscription, but rather a public awarness campaign. "It's purely education. It forces you to see the difference, in the case of the two different sized cups," Bloomberg said. "The public does act when they get the information. And all we're doing here is saying, 'If you want to order 32 ounces of soda, in a restaurant that we supervise, this restaurant must give you two 16-ounce glasses.'" Some New Yorkers supported Bloomberg's decision and called it a step in the right direction. "I think it's a good way to send a message that he's supporting healthier lifestyles," said one woman. "I don't think it's the mayor's job to decide what sort of soft drinks that people in Manhattan or anywhere in the world want to buy," said one man. In statements, both Coca-Cola and McDonald's came out against the proposal. Coke called the plan an "arbitrary mandate" and encouraged New Yorkers to "loudly voice their disapproval." McDonald's labled it "misguided" and said that solving the obesity epidemic "requires a more collaborative and comprehenisve approach." "Would you suggest that if there's asbestos in the building we stay away and just let people walk in and out ofthe building and die from cancer? I don't think so," he said. Bloomberg has a history of enacting legislation to try to make New Yorkers healthier. Since becoming mayor, he has banned smoking in many public places, outlawed trans fats in the city's restaurants and required chain restaurants to post calorie counts. The ban on sugary drinks requires approval from the city's Board of Health. If passed -- which is considered likely because Bloomberg appointed all the board's members -- it could take effect as soon as March. ABC News' Dr. Richard Besser, Joanna Stern and The Associated Press contributed to this report.